Frequently Asked Questions - The Original Book Works Ltd. It looks and feels like real leather, but what is it? To the surprise of many of our clients, we use a specially formulated (and secret) resin mix to produce our products. These are hand painted by artists, then gilded and polished. They are all made to order at our modern factory in Oaksey, Wilts. So as you make it, can I have my products customised? Of course you can. We have a range of colours that we produce the items in and you can order them in the traditional Tan, Red and Green, as well as the new Velum (white) and Black. We can also customise the names on the spines and even have logos engraved. Call the office on +44 (0) 1285 641664 to discuss the details, or drop us an eMail. We have over 15 years experience of bespoke projects and always welcome a new challenge. 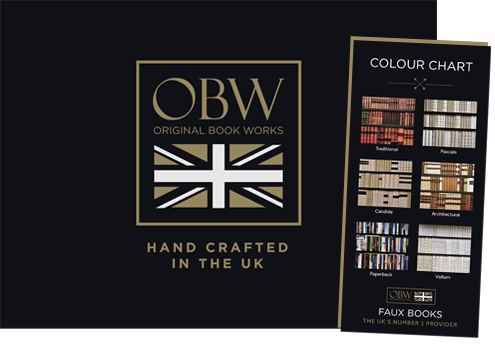 We have covered all sorts of surfaces with our faux books, from doors, cupboards, gun safes and radiator covers to yachts, stately homes, The British Museum and Michelin stared restaurants. For more FAQ's on book products, go to: www.fauxbooks.co.uk. But we don't stop with the books. We are able to recreate stone, wood and rare leathers. We have worked on a large number of high-end projects making everything from balustrades and intricate wood carvings to chimney surrounds, arches, columns and significant statuary. We can make a facsimile of almost anything and are able to design and manufacture from scratch. If I have something copied is there a danger of damage? The danger is very slim. Top museums trust us to copy and reproduce some of their most valuable articles. We have even copied the famous guards Eagle, captured at the battle of Waterloo. How secure are credit card details? We take the greatest possible care with our information. Your financial details are put through a 128 bit encryption system on a secure server.